Familiar eyes with new sight. Tonight I beheld such beauty that my breath departed my body just to be close to yours. ground. Ten feet. Bits of black bark heralded her descent, tugged at her artfully tattered skirt and chewed holes in her fishnet stockings. Ignoring her pounding heart and sweat slick palms, she toed down the trunk to find a footing on the last branch. When she discovered who had put the skeleton in the tree, she would curse them until their descendants evolved. Of course, she might have to stand in line behind the man. The man. Balancing on the thick tree limb, she dried her palms on her skirt. Perhaps he wasn’t dead. Perhaps he was just stunned. She glanced up through the branches of the dead oak. Old Reidon had been wedged about twenty-five feet up. Twenty-five feet times gravity would give her the force behind the crash. Lonnie chewed on her bottom lip. Well, it would if she could remember the conversion factor from feet to meters. Still, Old Reidon couldn’t weigh that much. He was made of the new lightweight plastic, much better and more durable than the old skeleton. In fact, the impact hadn’t damaged the bones at all. The stranger was another matter. Coward. She shrugged off the slander. Okay, so she’d skipped town before giving Orren an answer to his marriage proposal. That didn’t make her a coward, did it? She’d always faced the consequences of her actions before. Which is why you’re up a tree now, instead of down on the ground, tending to the man you bombed with a skeleton? Broken broomsticks, when had her conscience become so acerbic? Exertion burned along her thighs as she squatted then gingerly plopped her behind onto the branch. Tufts of dead grass beckoned from five feet below. A crow hopped into her landing space and pecked at the ground. Her grease-filled lunch threatened to shoot out of her stomach. Five feet. Four inches less than her modest height, yet a daunting distance when hovering above the earth. Bark confetti rained onto the ground as she shifted on her perch. She’d have to jump sometime—her victim needed first aid. The breeze carried his low groan to her. At least, he wasn’t dead. Unconscious, not dead. Not that she’d actually believed manslaughter was an appropriate punishment for cowardice. Jumping Jack-o-lanterns, that nasty noun had popped up too often today. So she’d left—but she always returned to Pumpkin this time of the year. In fact, her vacation request had been in her personnel folder since she’d started working at the Prior-Tea Clinic. Orren’s proposal and her departure was a simple case of bad timing. It most certainly did not indicate any invertebrate tendencies on her part. “Caw. Caw.” The crow cast a yellow-eyed glance at her before hopping away. Now was not the time for self-analysis. The man was hurt, and she just might remember enough of her first aid training to help him. Lonnie pushed off the branch. Her landing rattled up her bones and out her skull. Knees complained as she straightened—she would feel her daring rescue of Old Reidon in the morning. As for the stranger, he was feeling her rescue of the skeleton now. She stepped into her boots. Their buckles slapped worn leather as she circled the trunk. Lonnie stopped as her heart picked up tempo. Orren Prior was a doctor. A doctor with a normal male voice. A doctor with good looks, old money and an older family name. With those assets, he didn’t need a voice like liquid chocolate. And he certainly didn’t need her. So why had he asked her to marry him? Lonnie palmed her giggle. Not many men would have a sense of humor after being knocked unconscious by a skeleton. Unconscious? Brain trauma. Concussion. What other horrible repercussions could result from the skeletal walloping? Startled, the man bounced on the ground. After stuffing the skeleton behind his back, he turned to face her. Cobalt blue eyes flicked over her with the precision of a laser. Interest flared in the blue depths. Lonnie clasped her hands together. She was practically an engaged woman, would be engaged if she had answered Orren. And she wasn’t flirting. She was simply sharing a laugh over the absurd situation. “I believe weight to be the least of your problems.” She squatted before him. Evenly dilated pupils focused clearly on her lips. She could probably rule out a concussion. A wisp of Old Spice aftershave teased her. Her nose twitched. The clean scent hinted at subtle layers waiting to be discovered. She should keep him under observation, maybe even overnight observation. Just in case. “You willing to share my problems with me, honey?” The right corner of his mouth lifted, propping up the dimple in his cheek. “How can you tell?” Brown eyebrows met over his aquiline nose. “I mean without the obvious, er…” Embarrassment darkened his cheeks. “The obvious?” Amusement trickled through her. Such chagrin over the simple mention of body parts. Her gaze flicked over him. Not that his weren’t a fine example of his gender. Broad-shouldered and narrow-hipped. Waves of muscle played over bones. A fine example of manhood, indeed. His gaze slid down her shoulder to linger over the area in question. Desire cast heat across her flesh. This was no clinical observation; this was her treacherous body layering innuendo onto a scientific explanation. Images flickered inside her skull, an 8-mm film of skin and passion. Lonnie shook her head, scrambling the thoughts. What was she thinking? Fantasizing about a total stranger. A good-looking stranger, true, but she might be an engaged woman, an almost-wife. She cleared her throat and straightened. Whatever spell he had cast over her would have to be broken. She needed to think clearly—without pheromones, animal musk and that bulge in his pants distracting her. He pressed his hand to his chest, swept those blunt fingers over firm muscle. Her breasts tightened. His actions were suggestive but tame compared to the minefield of sexual implications in his statement. Delightfully sinful; decidedly taboo. Lonnie ignored the smile tugging on her lips. She had only one weapon in this game: innocence. “Unless you’re planning to consort with any more skeletons, I don’t think you’d need a crash course in anatomy.” Science tackled his sensuality. It’s for the best, Lonnie. “Attacked you.” She clasped her hands behind her back, milking her fingers. Attacked was such a harsh description. “The Prankster. This is the second time one of his tricks has almost resulted in a serious injury.” He rubbed the back of his head and stared up at the tree. The Prankster. Unease feathered across her skin. Everyone knew that things heated up between Pumpkin and Holly as soon as the temperature dropped. Still, her mother had warned her that something seemed different this year. A new malevolence had descended with the autumn mist. Except the Prankster wasn’t responsible for the skeletal attack. She was. Confess. Now, before his theories grew out- of-hand. “Huh, yeah.” He twisted on the ground, presenting her with his back. His silky hair slid between her fingers. Nice hair. No broken skin. I wonder what kind of conditioner he uses. A little red patch here. Nothing fruity but definitely spicy. Air hissed through his teeth. brushed her hands aside and cupped the swollen skin. Pain laced the grin on his lips. Lonnie smiled. All standard issue in the Holly High bag of tricks. All met equal retaliation from the Pumpkin Predators when the Christmas season rolled around. Mayor Russell. Tutmoses Russell, her old high school beau and captain of the Predators football team, was now mayor of Pumpkin. Not that his election to office was a surprise. Most nominees had to be coerced, bribed or tricked into running for the position. Lonnie tucked her hair behind her ear. No, what surprised her was that Tut, a diehard Pumpkin native, had hired an outsider to keep watch. “Not quite.” Muscle bunched against his clenched jaw. The man pushed off the ground to sway on his feet. Lonnie followed him up and steadied him. Corded muscle tensed under her touch. She waited for him to pull away, reject her assistance. He didn’t. She blinked. From Holly. From Holly. She snatched her hand off his arm. The only thing worse than an outsider was someone from Holly. How could this be? He didn’t have reindeer antlers on his head or sleighbells around his neck. And if he’d jumped out of some bad kid’s closet on Halloween, their fathers would be running for the shotgun for an altogether different reason than slaying the scary monster. “You’re from Holly?” she croaked. “Born and raised.” Pride glistened on his face like an oil slick on the ocean. Lonnie’s stomach bucked. She had dropped Reidon on a resident of Holly. And not just any resident of Holly—its peacekeeper. No one on either side would believe it was an accident. “Nicholas!” A man’s voice boomed across the clearing, strong and authoritative. Lonnie swallowed a groan. Her day was going from boiling caldron to bonfire near a stake. Dugan. Every child in Pumpkin knew the name of the boogeyman. It was The Dugan. A whimper squeaked through her tight throat. She had conversed with a Dugan from Holly. All of her ancestors were clawing their way out of their graves to curse her. She had to get away; she must get away. She stepped backwards, tripped over Old Reidon’s boney arm. A hand wrapped around her elbow, pulled her forward. Disbelief spread through her. The serpent actually beamed at her. Could he really not know who she was? She shook off his touch. If he didn’t know now, he would soon. Father Bean had been determined to mend the rift between the two communities since his Volkswagen van broke down outside the towns in 1972. Lonnie stumbled backwards; her shoulder slammed into the tree trunk. 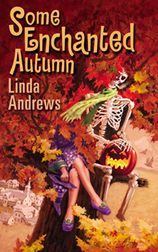 Cinders and snakes, the stupid skeleton seemed to have wrapped itself around her feet. “Ah, Nicholas, there you are.” Father Bean pushed aside the branch of weeping willow, waddled through the white picket fence and trod onto the dead grass. “I believe you would serve the communities better inside the church. Indeed, I must insist—” He faltered mid-step. Brown eyes widened in surprise as they gazed at her. “Lynch.” Lonnie hefted the skeleton off the ground, tossed him over her shoulder and strode toward the clergyman. The priest would protect her from The Dugan. “Father.” Lonnie returned his embrace, resisted tugging on the gunmetal ponytail winding down his back. No one knew what denomination had ordained the aging draft-dodging hippie, but everyone respected his calling. Besides serving as preacher and justice of the peace, he was the only mediator the two feuding towns respected. And she would need a mediator. A Holly jail cell was no place for a witch. His gaze slid from her to Old Reidon. A heartbeat later, light flared in his eyes. He had made the connection but leapt to the wrong conclusion. Lonnie raised her chin and met his accusing stare. Father Bean would help her with The Dugan. She squeezed her eyes closed as he reached for her. The Christmas Curse—one touch from The Dugan, and every time you opened your mouth Christmas carols would pour out. “You won’t be able to stop yourself.” Her father’s voice rang in her head. The Dugan’s touch was soft—a gentle tug on her hair and it was over. She peeked through her lashes. A black twig spun in his fingers. Had she been cursed? Lonnie filled her lungs. She wouldn’t know until she answered him. “Don’t go getting a wedgie over it.” Relief shook her legs. She hadn’t been cursed. about to repeat itself? Was a Dugan about to publicly out another witch? She dodged left and crashed into The Dugan’s chest. Cold metal wrapped her right wrist. She jerked away before he closed the other. The free handcuff slapped her forearm. “Lonnie!” The screech disturbed the pigeons parading across the green grass. “Lonnie Lynch. I never would have believed it if I hadn’t seen it for myself.” Primary colors swirled around the thin woman sailing past picnic tables laden with baskets, platters of delicacies and bowls of food. “Guess I should have read my tea leaves after all.” Gold bracelets, hoop earrings and rings jangled to a stop as their owner folded Lonnie into a welcoming hug. “Well, she tried to, anyway.” Orren Prior, only son of the founders of the exclusive Prior- Tea Clinic, strode onto the grounds of the Between the Towns Gospel Church. His designer silk shirt and soft wool trousers flattered his gym-toned body and reeked of money. Lonnie shook her head. If someone had told her ten months ago that people could smell like money, she would have laughed. Ten months and one day ago, she hadn’t worked for the Prior-Tea Clinic, hadn’t known a clinic could resemble a five-star resort, that check-ups routinely lasted ten days or that breast lifts were emergency surgery. And the money coming in would soon quadruple thanks to the new multimillion-dollar wing dedicated to holistic and naturopathic medicine. She smoothed her costume over her hips. Spiders and frog’s lips, she hadn’t meant to sound so annoyed, but what could he expect? Irritation wiggled over his face before he smiled. His smile was as fake as hers. “I guess you wouldn’t believe that I was just passing by?” He frowned as his gaze raked her from head to toe. The ragged dress, the buckled shoes and funky stockings could only add up to one thing: witch. “Out here?” She resisted the urge to squirm. This wasn’t the Inquisition. This was the twenty-first century. She was a doctor, a scientist researching at a prestigious clinic where vain clients valued reputation over skill. Orren’s family clinic and Orren’s clients. Her insides writhed like snakes in a sack. His presence was a harbinger of things to come. But were those things good or bad? She was afraid she’d find out all too soon. “Aren’t you going to introduce us?” An elbow poked her in the back. “They’re all unusual in Pumpkin,” The Dugan piped up. Lonnie edged him out of their group. “And the only other people worth introducing are Father Bean and Old Reidon.” She held out the skeleton’s hand. “A Dugan!” Honey sidled behind Father Bean. “The Prankster has injured two people.” The Dugan glared at her. “Injured?” Dollar signs flashed in Orren’s eyes. “A man was thrown from a tree?” Orren gasped. “The skeleton is Reidon?” Orren deduced. Her friends turned to the only one from Holly in their group. “I see more of my flock has come out into the pasture.” Father Bean wedged himself between the citizens of the two towns. “Allow me, Nicholas.” The priest beamed. Betrayal whipped through Lonnie. The clergyman couldn’t really believe she was responsible for the tricks. Sure, she’d done her share of mischief in the past, but she had been out of town for this latest batch. The priest clasped her hand and gently squeezed it then turned to face the crowd spilling onto the lawn. “Ladies and gentleman, I believe I have the perfect solution to our problems.” He shoved her forward, The Dugan kept pace. “You gonna perform a weddin’ ceremony, padre?” A voice wheezed from the quieting mob. Father Bean raised his hands, and silence once more cloaked the crowd. “You calling us liars, Pumpkin-eater?” A dark-haired man shoved to the front of the crowd. “If the sanctimonious bull fits.” Tut shoved out his chest and raised his fists to his waist. Lonnie would bet the farm her old beau could take the newcomer—she slipped her hand through Honey’s—but a little magic never hurt. Rumbling rolled through the crowd. More flesh appeared as sleeves were rolled up. Lonnie nodded. She had a problem with this little assignment. Scratch that. She had a big problem with being paired with The Dugan. “She has just arrived back in town after a year’s absence, Nicholas,” the priest informed. “Deer droppings.” The Dugan kicked the ground. Dugan into Pumpkin. Fear rumbled through the townsfolk. For the first time in her life, she wondered what the folks in Holly said about them. Were Pumpkin residents the equivalent of the Grinch or Scrooge? And how would they feel about one in their town? Lonnie watched her cousin trail after the priest. What did he want with Honey? No way to find out unless she eavesdropped. Her feet turned her in the proper direction. A hand stopped her from moving. Lonnie swatted at a fly buzzing by her head. When had a cyclone sucked up her life in its destructive vortex? More importantly, how was she to make it stop? Except he would always be his father’s son. Nick swallowed the denial. He hadn’t exactly volunteered to go. And yet, he couldn’t quite regret Father Bean’s nomination. He, Nicholas Dugan, was to be the first adult resident of Holly to set foot in Pumpkin in almost a hundred years. Maybe he could even discover the truth behind the rift in the communities. He hitched up his pants. After he got to know the delectable Miss Lynch a little better. “I know, dear. I know,” she soothed. Nick ears twitched. They were going to try to talk him out of seduc—er, investigating. “The reason why no one in Holly has set foot in Pumpkin for almost a century,” Burl pronounced, handing Nick the piece of yellowed paper. Brown letters marched across the torn and crumpled parchment. A broken heart is not the only harm a Dugan can do. Love will raise an ill wind whenever souls mate, with a spoken vow the only safe harbor. A pentagram was stamped at the bottom. A witch’s mark. A witch’s curse. The hair rose on the back of his neck. Lonnie Lynch was a witch. Sweat stung his eyes. She’d also paid particular attention to a certain piece of his anatomy. “Is something going to fall off?” He casually cupped his hands in front of his pants zipper. Nick stared at the paper. A curse on the women of his family. His resolve hardened. He had to protect his niece. She was just a child, an innocent and those … those witches had cursed her. “I could write you a note,” his mother offered. “Father Bean is not going to accept a note from my mother. This is my job, not a grade school assignment.” Nick folded the paper with the curse and tucked it into his pocket. “One of those witches?” His new partner was a witch. One of hundreds, if you included the entire female population of Pumpkin. He had to find a way to narrow the list. Motive. Motive tended to be quite specific. Nick shook his head. He was going. His family needed him. “I’m a peace officer. I need to go and find out who is responsible for these pranks. If they continue through Halloween our Christmas season is going to be a nightmare.” Warmth blazed up his arm. “What is that?” His mother pointed to his arm. “Twenty feet!” He couldn’t go home. Neither could he do a little late-night snooping. “Why can’t he stay in Holly and investigate?” Mattie wrung her fingers. “I’m ready.” Nick stared at the cuff one last time. Curses, witches, pranksters and Lonnie Lynch—autumn in Rim Country was never dull. This entry was posted in Books and tagged Chapter 1, Paranormal Romance, presale, Some Enchanted Autumn. Bookmark the permalink.